Assaults, sexual harassment, insults, online hate, threats, bullying or discrimination – violence takes many forms but it is still too often a taboo topic. Countless employees and workers have already experienced or observed violence, but many do not know how to handle it. Unions must find their common voice on this issue. So ETF was proud to join a conference about violence at work, online and at home, organised by unions and workers’ groups in Vienna. “With today’s conference on violence, we want to contribute to eliminating any taboos that exist. Many employees and workers feel that they are badly informed or not informed at all about what rights they have and what assistance is available. In addition, we want to encourage as many people as possible to openly and energetically oppose any form of violence against women. A life without violence is a human right!” said Elisabeth Vondrasek, deputy vice president and federal women’s president of Austrian ETF affiliate vida. The ETF’s political assistant for gender equality, Inga-Lena Heinisch, also spoke at the conference and presented the outcomes of the ETF survey about workplace violence against women transport workers in Europe The report documents a pervasive culture of sexual harassment and sexual intimidation in the workplace. Women working in the sector are often subject to repeated, hostile and offensive verbal, non-verbal and physical forms of violence, including sexual harassment. The ETF will launch a campaign against gender-based violence on 25 November 2018. The aim of this campaign is to raise awareness on the issue, and help social partners conclude better policies addressing workplace gender-based violence at company level. The conference took place in Vienna on 30 October 2018, more than 200 participants discussed approaches to ending gender-based violence. 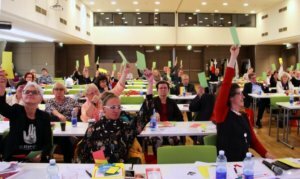 It was organised by ÖGB women, vida, the Austrian Chamber of Labour Vienna, the Association of Autonomous Austrian Women’s Whelters and WEISSER RING. See more information about the conference on vida’s website.